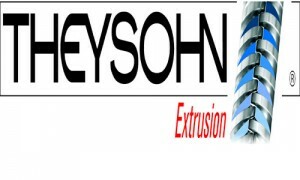 Theysohn Extrusionstechnik GmbH the “ALL-in-ONE”-supplier has a very wide range of products which will be further continuously developed and adapted to market requirements. Visit us at the K-Show 2013 (Düsseldorf, Germany) – hall 16 D21 – and assure yourself of the THEYSOHN Quality. TTM-XTP 87 profile extruder with CON 63 pillar version for production of PVC window profile and raingutter with recycling core. With this space-saving extruder installation up to 500 kg/h profile with core-coex-process can be produced. Because of the core-coex-process raw material prices for profiles can be further reduced. The flexible installation of the two extruders gives the possiblity to use the most different tools. With one control cabinet and one central control both extruders can be operated. Highest output with minimized energy input allows to run a cost-saving production. A minimum on space requirements of the coextruder makes a retro-fit of existing extrusion lines (independent from manufacturer) possible. TTM-XTR 122 pipe extruder in 36D barrel version for an output up to 1300 kg/h sewage and pressure pipes from new PVC material als well as from recycling material. The TTM-XT series with the well known Theysohn Torque Master gearbox in XT-vertical design stands for highest performance in output, extremly long bearing life expectation and further reduced energy consumption. An oilpump integrated in the gear box reduces cost for maintenance, spare parts and energy. XTR, a further development of the well known TTM series for the cost optimized production of pipes. CON 68, the new, conical twin screw extruder Doppelscheckenextruder with output up to 350 kg/h. This design size combines decades of know-how in conical extruder manufacturing with the performance segment of 350 kg/h. The CON 68 has been specially developed for the production of duct-, pressure- and sewage pipes up to 110 mm (3 “). The short and space-saving design makes highest performace with reduced space requirement possible. For the usage as coextruder has this conical extruder the ideal mounting form. The flexibility in process technology of conical extruders in this performance segment is unbeatable. The optimal price/performance realtion of the conical series is convincing. 3 extruder systems will be connected through LAN with one data recording center. Through interfaces all production datas of the machines can be read and edit. The datas will be formated by customer request and will be provided for further handling in the company. By direct conncetion to the LAN system remote maintenance through Internet by Theysohn will be possible. Options of remote maintenance contracts will be introduced at our booth. 3-layer PVC pipe with foam- or recycling core: the system TW 4-10 Feedblock and the PVC- pipe head RKS 3 for pipe dimensions 75 – 250 mm foamcore or recycling core pipe offers highest flexibility with a wide dimension range in the production. The newest generation of the feedblock allows an optimum on skin wallthickness distribution and highest reductions on weight. With the new feedblock many different formulations and PVC-K-values can be processed on one system. With the change of the pipe head and without any other changes at the feeblocksystem smaller and larger pipe dimensions (32 – 710 mm) can be produced very simple. A many years proved system with highest flexibility for highest requirements. Twin strand – pipe extrusion for highest performance: the diverter block DS 20 with 508 mm axial distance makes the installtion of 2 RKS PVC pipe heads for the production of pipes from 32 – 110 mm OD in highest performance area possible. This installation is used for hot water pipes from C-PVC as well as pressure-, sewage- and conduit pipes from PVC with output up to 1300 kg/h. The output performance can be doubled in comparison with a single strand line and the space requirement can be reduced for about 50 %. The use of bigger extruders reduces the energy consumption for about 17 % compared with 2 single extrusion lines. The intelligent solution to increase your profit margin. The hot-cutting process is the optimal way for PVC pelletizing. With change of speed and number of cutting knives, as well as change of the size and number of holes in the exit plate, each requested output range or pellet size can be produced. A water cooled double jacket at the cutting housing increases the output and reduces the colling costs. Additional fan blades in the rotating knive holder produce a turbulent air stream, which prevent sticking together of pellets and supports the discharge to the downstreaming cooling device. A technical perfect solution for continous production. 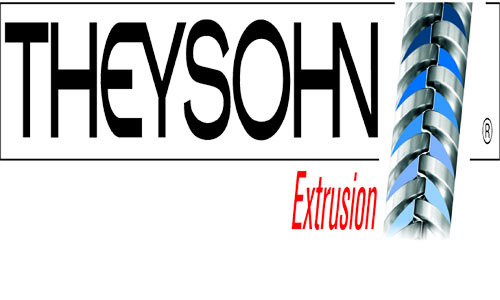 Theysohn Extrusion is the umbrella for the extrusionsprofis Theysohn, Topf and Extruder-Komponenten Salzgitter. With production sites in Austria and Germany as well as sales offices in Russia and India Theysohn is operating worldwide. The group of companies combines more than 40 years of experience in extrusion technology.